Ive been following J&M Acres Horse Rescue on Facebook for about 6 months now. They are based in Maple Ridge, BC and have been running the rescue for over 15 years. The have successfully saved and re-homed literally hundreds of horses. All breeds, all ages. Horse rescue is something very close to my heart. We live in a ‘throw-away’ society and horses are suffering daily because of this. Overbreeding, neglect, poor economy, abuse & ignorance have left us with thousands and thousands of unwanted horses that get shipped off to slaughter in Alberta every week. Please visit www.jmacresrescue.com to read more about the Rescue & the people who dedicate their lives to helping these horses. 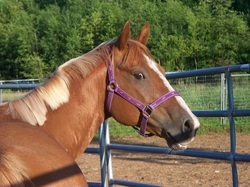 They have several beautiful, loving horses looking for forever homes right now. Please do visit their site and see how you can help! !